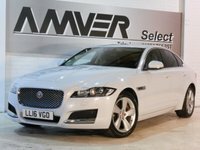 A one owner new shape XF Portfolio with full Jaguar history and Jaguar new-car warranty until July 2019. Glacier white pearlescent with 18" alloys, Portfolio-exclusive black Windsor leather with Herringbone perforations & Figured Ebony accents. Luxuriously equipped with some very useful features for the winter months like electric heated seats, quick-clear heated windscreen & JaguarDrive controls with Winter mode plus other great features like the InControl Apps system, built in Wi-Fi Hotspot, touchscreen satellite navigation, reversing rear-view camera, voice commands system, Meridian audio with DAB radio, Bluetooth, electrically adjustable lumbar support, rain sensor wipers, electric folding mirrors, automatic headlights, cruise control, speed limit warning system, front & rear parking sensors & more. A real pleasure to drive with its 8-speed automatic gearbox with Sport, Winter, ECO Pro & Dynamic modes plus steering wheel gearshift paddles for times when you want a bit more fun. This car comes with complete book in Jaguar leather wallet, two keys, 36,000 miles with full Jaguar main dealer & specialist history and the balance of its Jaguar new-car warranty, valid until July 2019. We have signed AA's Dealer Promise which means all cars are provided with a full history check, 12 months AA breakdown cover or member upgrade and other exclusive AA member benefits. Finance available with no deposit, subject to approval. Part-exchange welcome.